Many Congratulations to Tracey and Steve who were married at one of our most favourite local venues – The Roslin Beach Hotel, Southend-on-Sea on Thursday 23rd August. 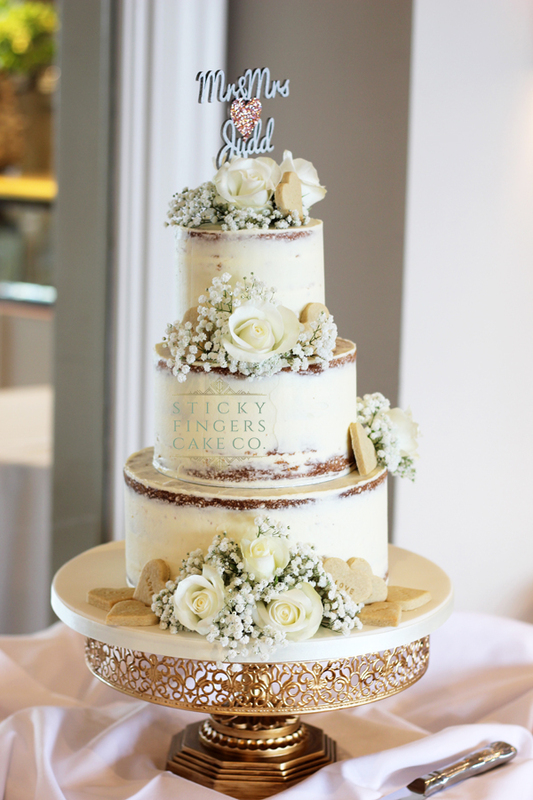 The happy couple chose to have a gorgeous 3 tier semi naked wedding cake which I decorated with white roses, gypsophila and some vanilla heart shaped mini cookies – another treat for their guests to tuck into! Victoria Sponge, Lemon Drizzle and Strawberry & Champagne were their yummy flavours were and I displayed their wedding cake on our new ornate antique gold filigree cake stand. Semi naked wedding cakes are still proving to be a popular choice for weddings in 2019 and 2020 too! Sending you both warm wishes for a long and happy life together!